!! OMG, it got gayer: San Francisco !! Artist LIZ HICKOK has made San Fransisco even more colourful and delicious by rebuilding it in Jell-O. I make the landscapes by constructing scale models of the architectural elements which I use to make molds. 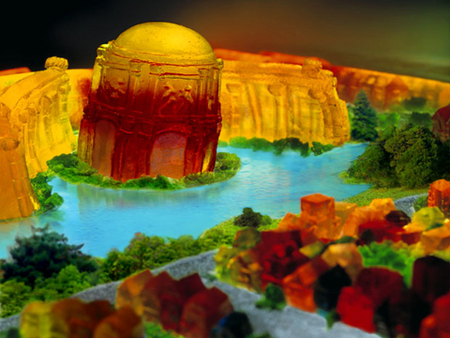 I then cast the buildings in Jell-O. Similar to making a movie set, I add backdrops, which I often paint, and elements such as mountains or trees, and then I dramatically light the scenes from the back or underneath. 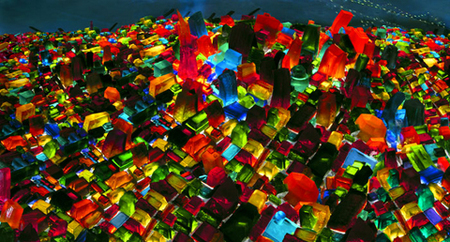 The Jell-O sculptures quickly decay, leaving the photographs and video as the remains. Be the first to comment on "OMG, it got gayer: San Francisco"